The manner in which the EBRD engages with stakeholders helps us to improve our environmental and social policies and evaluate the impact of our work on daily lives. Throughout 2016 the EBRD continued its active engagement with civil society organisations (CSOs) in countries where it invests, using modernised tools to contribute to the Bank’s overarching institutional strategic priority of re-energising transition. Civil society is a crucial vehicle for citizen engagement. It plays an important role in propelling political and economic transition processes, sometimes also contributing to a greater demand for and societal acceptance of democratic and market-oriented reforms and, ultimately, holding governments accountable for their policies. For the past year we have been focusing on the following levels of engagement: Outreach, Dialogue, Consultations and Cooperation. In 2016, almost 3,400 CSO representatives were registered with the EBRD and nearly 400 civil society stakeholders participated in around 50 thematic meetings and events organised by the Bank. Since May 2015, the EBRD has been taking steps towards greater transparency by publishing available data on its investment operations according to International Aid Transparency Initiative (IATI) standards, which provides common definitions and publishing standards for the activities of a number of institutions – including the EBRD and other development finance institutions (DFIs) – and thus improves access to information about their work. In April 2016, the Aid Transparency Index – published by the NGO Publish What You Fund (PWYF) – acknowledged the EBRD’s efforts to improve its transparency and accountability by significantly improving the Bank’s rating. 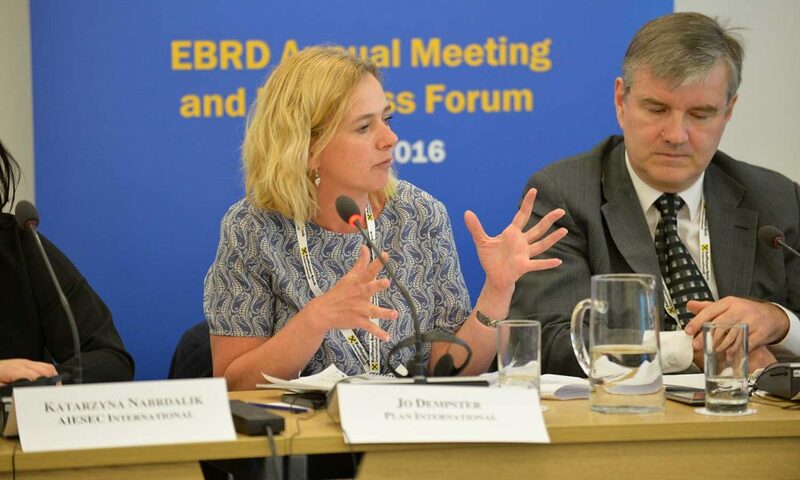 The EBRD is committed to broadening its engagement with civil society at the highest level. The President of the EBRD and other representatives of senior management and the Board of Directors routinely meet with CSO representatives during their visits to countries of operations. In 2016, such meetings were held with CSOs in Azerbaijan, Egypt, Kazakhstan, Montenegro, Serbia, Tajikistan and Ukraine. Through their on-the-ground knowledge and close links with local populations, CSOs often alert and help the Bank to ensure its projects take the needs and concerns of local communities into account, contributing to the delivery of better projects and policies in transition countries. Our engagement with CSOs also enhances the Bank’s own accountability and transparency. In 2016 the EBRD engaged in dialogue with international and local CSOs on around 45 investment projects in some 20 countries across a variety of sectors. 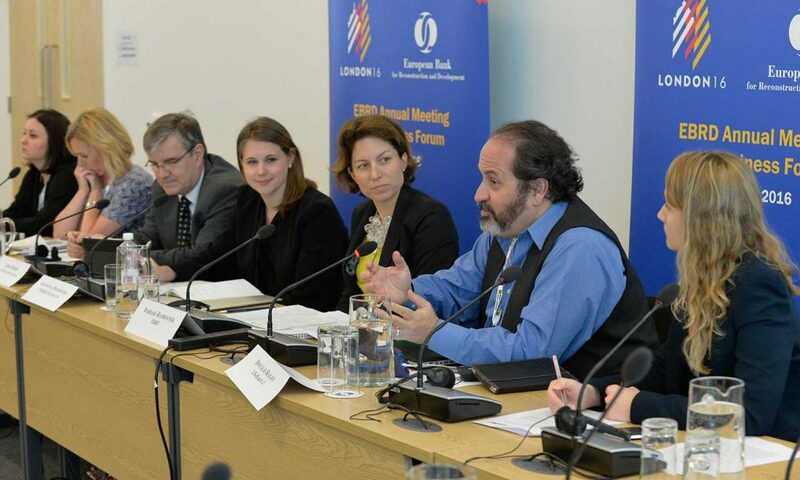 In its 25th anniversary year, the EBRD Civil Society Programme attracted around 100 civil society representatives from 22 countries to the Bank’s London Headquarters on 11-12 May. The event consisted of sessions between civil society representatives and the Bank’s staff and senior management, as well as two dedicated sessions with the Board of Directors and the EBRD President. Civil society participants were able to participate in multi-stakeholder discussions on a wide range of issues, namely: the role of civil society in transition; transparency in public procurement; youth, skills and economic inclusion; and gender equality. The civil society sector also featured prominently in the Business Forum with a session dedicated to the civil society group National Dialogue Quartet. The 2016 Civil Society Programme strengthened the shift in the EBRD’s engagement with civil society from dialogue to closer cooperation and partnership as we presented the preliminary results and achievements of the Bank’s Civil Society Capacity Enhancement Framework. In 2016 the EBRD continued its early-stage consultations with civil society, recognising CSOs as one of the key stakeholders who provide input in the Bank’s decision-making. At the country level, we consulted with local CSOs on the Bank’s first strategy for Greece and on reviews of the country strategies for Belarus, Egypt, Georgia, Kosovo, Mongolia, Montenegro and Kazakhstan. CSOs were also invited to comment on all country strategies reviewed during 2016. Since 2013, the Bank has been scaling up its proactive cooperation with civil society through its Civil Society Capacity Enhancement Framework, a donor-funded programme that seeks to raise awareness, transfer skills and improve technical knowledge and organisational capacity among community-based CSOs in three areas in line with the Bank’s strategic priorities: sustainable energy and resources; economic inclusion; and investment climate and governance. The Bank is actively cooperating with international climate finance bodies, most notably the Global Environmental Facility (GEF), Climate Investment Funds (CIF) and the Green Climate Fund (GCF), all of which consider civil society engagement to be an important aspect of green finance. For example, the Civil Society Engagement Unit (CSEU) is part of the GEF Working Group on Public Involvement. The CSEU also liaises closely with colleagues across IFIs that work on the role of civil society in promoting economic inclusion and good governance and is keeping pace with its counterparts in other IFIs, for example through the IO/IFI Working Group on Civil Society Engagement. In 2017, the CSEU will build on its current cooperation with international partners in areas relevant to sustainable energy and resources and the COP* process. Its work will also remain aligned with the Sustainable Development Goals (SDGs) which the EBRD participated in devising and delivering with a number of MDBs and the IMF in July 2015. The EBRD’s Environmental and Social Advisory Council (ESAC) was created shortly after the Bank’s founding in 1991. It is an independent body of environmental specialists who advise the EBRD on environmental issues such as policy, international standards, technical development, emerging trends and future opportunities. ESAC members are appointed for a set term and are selected based on their professional expertise as well as their potential to contribute to the development of the Bank’s policies and programmes. They represent a wide range of interests from non-governmental organisations, academic and research institutions and the private sector. In 2016 ESAC provided advice on the EBRD’s GET approach and asked for closer integration of the Bank’s Green Economy Strategy with the United Nations’ SDGs. Animated discussion between ESAC members in regards to criteria for green economy projects concluded that, as with the philosophy underpinning green bonds, financial institutions need to follow flexible rules and final eligibility should be a result of collaboration of interdisciplinary teams. The Council also commended the Bank on the results of implementation of the Gender Strategy, the ongoing development of the Economic Inclusion Strategy and commented on the introduction of the new process for country strategies. ESAC also reviewed the Bank’s internal improvements made to management of the Project Complaint Mechanism and voiced its support to strengthening this team. The EBRD is committed to minimising the environmental impact of its offices and business activities. We source all electricity for our London Headquarters from renewable energy suppliers. Office paper is certified by the Forest Stewardship Council® (FSC) as coming from sustainable sources. Since 2013, carbon credits have been purchased and retired at least equivalent to the greenhouse gas emissions associated with the organisation of the Bank’s Annual Meeting. Any emissions associated with the 2016 Annual Meeting and Business Forum in London were offset with carbon credits from the Sena Hydro Power Plant in Turkey, a project financed through the EBRD Mid-size Sustainable Energy Financing Facility (MidSEFF). There is also a strong emphasis on waste recycling, reducing the use of plastic bottles and sourcing environmentally friendly merchandise.